Travel alone can be stressful. Which is why staying organized and keeping tabs on your important products, documents and gadgets is an absolute necessity. Of course, organization is not every traveler’s strong suit. But, these three, easy travel hacks will help you to minimize unnecessary stress and enjoy the excitement of discovering a new destination. 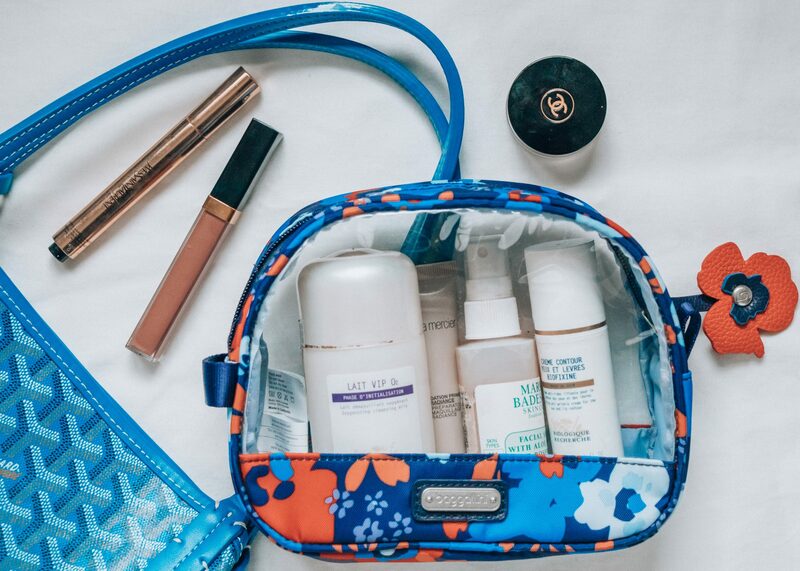 Keeping beauty, skincare and toiletries organized while traveling can seem like a near impossible feat. For ladies especially, limiting liquids and being able to dig out specific items we need in our horrendously oversized carry-on bags is always a struggle. Though, one thing has completely saved me with this. It is clear case cosmetic bags. Baggallini’s Poppy Floral Cosmetic Pouch is just this, without looking cheap and plastic. Being able to see exactly what’s in my bag without having to dig around or dump out the entirety of its’ contents saves an incredible amount of time and hassle. I especially love to use this for my inflight makeup and skincare essentials. Detangling, chargers, headphones, and electronics cords can be one of the most frustrating things while traveling. 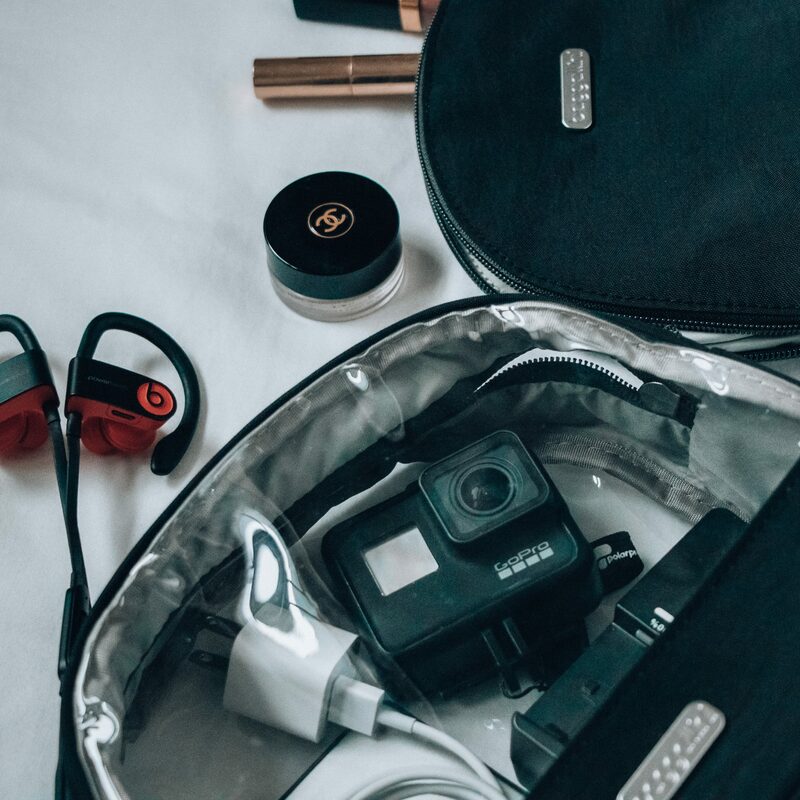 Stowing these items in a separate pouch is the easiest way to keep your travel and tech accessories organized while on the road. The Cosmetic Trio Set from Baggallini is my favorite for this purpose. The clear case provides visibility and is ideal for my electronics, including my computer and phone chargers, noise-canceling headphones, and external hard drives. The medium size pouch stores all of my snacks. While the mini pouch is used for my lip balms or small makeup items that I can easily transfer to any handbag while traveling. Each case is a slightly different shade and size, allowing for effortless differentiation that translates to less time digging around your bag. 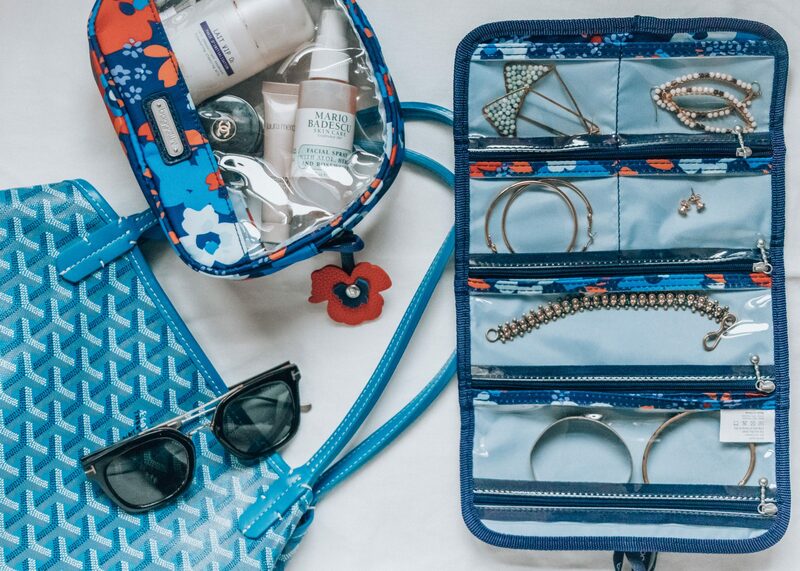 Keeping accessories compartmentalized and separated is the key to travel organization. We often tend to forget accessories, and just end up throwing them in a random pocket or pouch. I can’t tell you how many times I have been frustrated by tracking down a second earring or detangling necklaces. This super thin jewelry roll makes storing your jewelry so easy and finding the piece you need in destination even easier.